I love sweet buns I could eat them all day long, they are one of my favourite things to make in a kitchen. 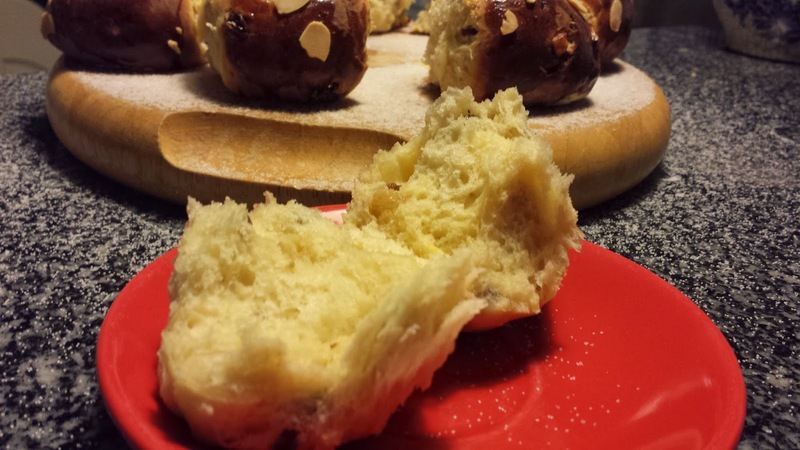 When I recently saw this recipe on a Spanish blog I knew I had to make them. I set about translating the recipe in to English and baking my very own version, these tasty buns are speckled with fruit and almonds. 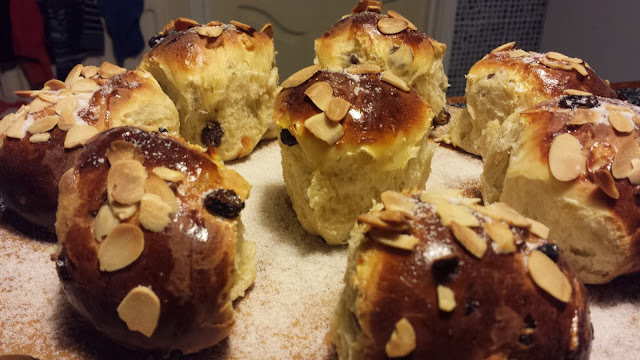 They remind very much of hot cross buns without the spice, and in fact when I make these again I think saffron would be a lovely addition to enhance the flavour profile. I do hope you enjoy this recipe as Mary Berry says they are scrummy, love that word and lady. Ingredients ( makes 8 ) adapted from "L'Exquisit"
Bring together into a ball and then knead for 8 minuts until dough is elastic. Then add the candied fruit, raisins, almonds and zest bit by bit. Form a ball and let rest covered with a damp cloth for an hour. Place on a lined tray with all the balls pressing together in a circle, cover with cling film and let rest 90 minutes. Brush with egg yolk and spread the sliced ​​almonds on top. Bake at 200c/180c/400F/gas mark 6 for 15-18 minutes until golden.